What happens when you blow a tire on the way to work a high school band camp? You make a viral video of course! That's exactly what happened to five members of the K-State Wildcat Marching Band. With nothing to do except wait for AAA to come help them they made the most of their time and now have the entire state of Kansas cheering them on from afar. Check out their side of the road performance of Wabash Cannonball. 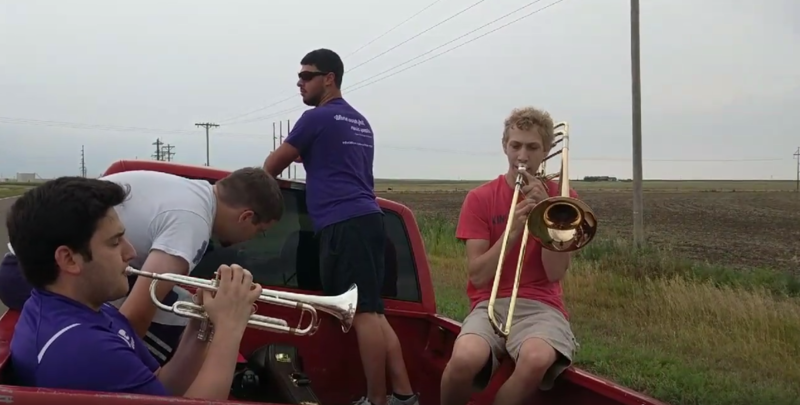 Yesterday, on our way to go work a band camp at Garden City High School, we had a tire blowout on a car, so we were stuck on the side of the road for a little while. We tried changing the tire, but since the car was at an angle in the ditch, it slid off the jack and broke it. So, naturally, being the band kids that we are, a couple of us pulled out instruments and started practicing. We got a little bored, so we decided to have some fun. I present to you, the Wabash Cannonball, Side of the road edition.